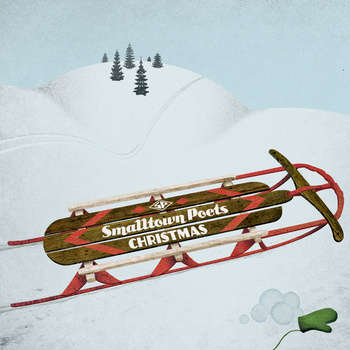 I have mentioned the release of the new Smalltown Poets Christmas album. Well, the day has finally arrived and we are so excited! I must admit that my husband's voice sure is dreamy. The whole album is amazing. You can even here my smalls lending their voices to the last track. There just happens to be a very large stack of boxes full of CDs in my foyer, and since I think it is imperative that you have a copy, I am giving one away right here! All you have to do is leave a comment telling me your favorite Christmas song. For an extra entry, tweet about the giveaway with a link to this post (my Twitter handle is @abjohnston) and leave a comment saying you did. This giveaway will close on Sunday, November 13 and I will announce a winner on Monday, November 14. If you just can't wait to add the album to your Christmas rotation, you can order a copy here or you can download it on iTunes. my favorite christmas tune of all time is jingle bell rock, especially if it's the dolly parton version. i can't help but get in the spirit when i hear that song! i also love oh holy night and santa claus is coming to town. christmas music in general really makes me feel joyful! Oh my word, I have so many favorite Christmas songs..."Carol of the Bells" is right up there with all my favorites and as a young'n I loved "I want a Hippopotamus for Christmas". Hahaha!!! Can't wait to hear this album-I'm a Christmas music junkie!! I am pretty certain that you blogging way back about the Christmas tree farm and video made me start listening to Christmas music then!! In the Bleak Midwinter is one of my favorites as is Silent Night and Deck the Halls. There are too many to choose from, really. I love a good Christmas album. Perhaps I need to go take a listen! Oh you know me and favorites. I can't pick them. I do love that Beetles song that starts out "So this is Christmas...". I also love What Child is This. My favorite is also In the Bleak Midwinter! The last verse of the song gets me every time. I also love Lo, How a Rose Ere Blooming. I used to love to play that on my flute. It's hard to choose one favorite Christmas song ...I love em all . But I do love Joy to the world because I remember vividly the lyrics coming to life to me after the Lord saved me as an adult.. After all those years of singing it my whole life, the line "let every heart prepare Him room" finally became clear to me! It IS difficult to choose just one favorite Christmas song! I will go with Oh Come all ye Faithful and Joy to the World. I was surprised to see that someone else also had Low How a Rose Ere Blooming on their list! I love that one as well! Breath of Heaven is my favorite, I think, but there are too many good ones to choose. ON CHristmas Day (w/ Ave MAria) is beautiful. Your style is lovely.